BlockAid® vinyl sound barrier protects your confidential information. In the age of information technology, protecting private conversations is a priority. Enhance your wall and ceiling construction by adding BlockAid® vinyl sound barrier. Keep confidential conversations heard only by persons for whom they are intended. BlockAid®, vinyl sound barrier, also known as mass loaded vinyl (MLV), is used to block unwanted noise and reduces sound transmission without reducing your space. One-eighth inch of vinyl barrier yields STC=27. Its 54 inch width easily covers drywall seams. Constructed of non-reinforced high temperature vinyl with no lead fillers, this material is as heavy as lead, yet easily cuts with a utility knife. 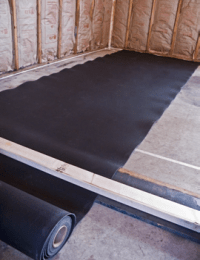 BlockAid® vinyl sound barrier is tough and durable. Originally designed to block transmission of sound through walls, BlockAid® is available as a backer for Cloudscape® Ceiling Tiles to limit sound flanking over office walls. BlockAid® is available in 20’, 30’ or 60’ rolls.